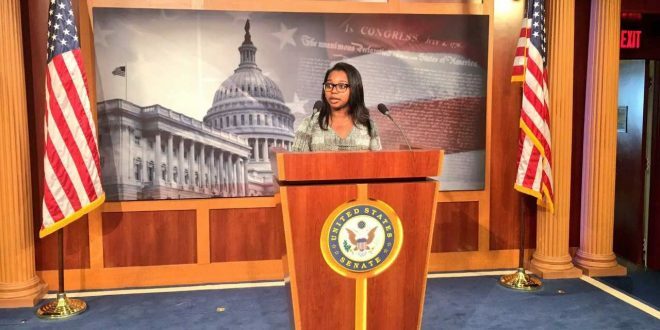 SGA President Maya Mapp took the nation’s capital by storm this summer. Mapp worked as a press and scheduling intern for Sen. Johnny Isakson of Georgia. Mapp worked in Isakson’s Washington D.C. office for six weeks, working from 8 a.m. to 6 p.m. everyday. Despite her schedule, Mapp still found the time to work with SGA senators on plans for campus. One of those plans was a pizza party at the beginning of the year. The purpose of the pizza party was to bring students, new and old alike, together to learn more about SGA. Mapp said this summer shined a light on the senate. She saw more independent work from senators and said she is excited for the changes to come. Mapp said she hopes to continue to be positive about this upcoming year while continuing to be honest and more transparent. A major point of emphasis coming into the new year is relying on her team, not a board, but a team. Mapp said she understands the importance of having a team of equal opinions. The communication between student government senators and the executive team is important, but the relationship between student government and administration is crucial. A year ago, Mapp was working with an interim leader. Now, Mapp is working with Dr. Richard Carvajal, who is going into his second semester as the campus president. With the new year upon us, Mapp is focused and ready for her second term as the student leader of campus. Written by Juston Lewis, Sports Editor.